Roy Of The Ravers has a new album coming out soon called Green Irish Tweed, and judging by the first 2 tracks he's given us in the form of artistic music videos, it seems as though he is taking his sound, typically of the squelchy acid house dance floor variety, in a slower more meditative direction inspired by the pentatonic scales of the Far East. Has Roy found enlightenment? We won't know until more information about these tracks and his new album emerge, but I certainly feel enlightened every time I watch this captivating video for Oriental X-Press. The animation (the source of which is still a mystery) looks vintage but unlike anything I've ever seen. 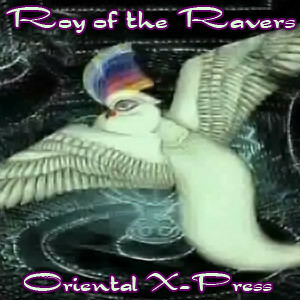 It's a sparkly journey of spiritual transformation in the style of ancient folk lore, and Roy's soundtrack is nothing short of perfection. It's unexpected, it's gorgeous, it's from another dimension and it makes me wonder what the rest of the album sounds like and what the connection might be to the Emerald Isle. The beat kicks in around 1:55, but patience is a virtue my friend. Here is the 2nd and only other video so far, even more downtempo than the first with a minimal intro beat reminiscent of Kraftwerk's Geiger Counter.